This has been a mad couple of days for me. The launch of the new look site has kept me so busy that I have only managed to get out fishing twice over the past four days! I am out on my first lure fishing Bass guide of the season today. I have to admit to being a bit nervous. Conditions are not bad, but you always worry about finding the fish when the water is this cold. It seems that the May water has arrived already. For those of you that don’t know, May water is a local name given to an algae bloom that normally occurs at this time of year. It causes the water to turn green or brown. It can be quite thick and you can feel it on your line sometimes. This has a negative effect on the fishing, as water clarity is effected. When Plaice fishing make sure you use plenty of beads and bling to help the fish see the bait. If you are after Mackerel, which there seems to be plenty about now, use silver tinsel type feathers. Spider crabs are also causing problems on Chesil, as they have arrived in large numbers. They have a nasty habit of snipping off your snoods to get to your bait. Bring plenty of hooks with you and adding floating beads can sometimes help keep it away from them. Another tip that normally keeps the snoods going for a bit longer, is to make your snoods (the section of line from the main rig body to the hook) out of 50lb braid. As anyone who uses braid will tell you how much of a pain it is to cut. As I have said before this site is not just about sea fishing as Martin Harvey proves. Martin Harvey, who likes to fish Chesil and has been waiting for the Mackerel to show, decided to indulge in his other passion, course fishing. He fished Woodland Lake, Coking Farm Fishery, Gillingham, Dorset. Mainly looking for Carp but well aware the lake held some nice Catfish. 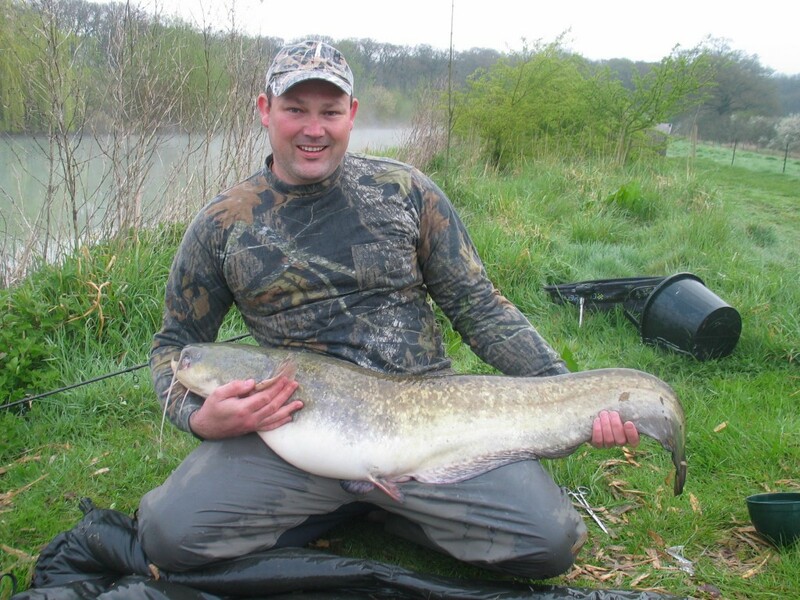 He managed to land his first ever catfish and also the lake record weighing in at 33lb. He spent 3 days and 3 nights with just this one fish to show for his efforts, but what a fish. He said it was hard fishing as the carp were not feeding, changing rigs, tactics and baits several times eventually netted him the fish. 72 hours well spent hours and very much worth the wait! A fish of the month contender for sure.